Cloud computing is widely recognized as one of the leading technological advances in recent years. It is a virtual means of accessing computer resources through the use of remote servers interconnected through the Internet. These resources can be stored in a private cloud infrastructure adapted to the requirements of a specific company and destined for internal use. 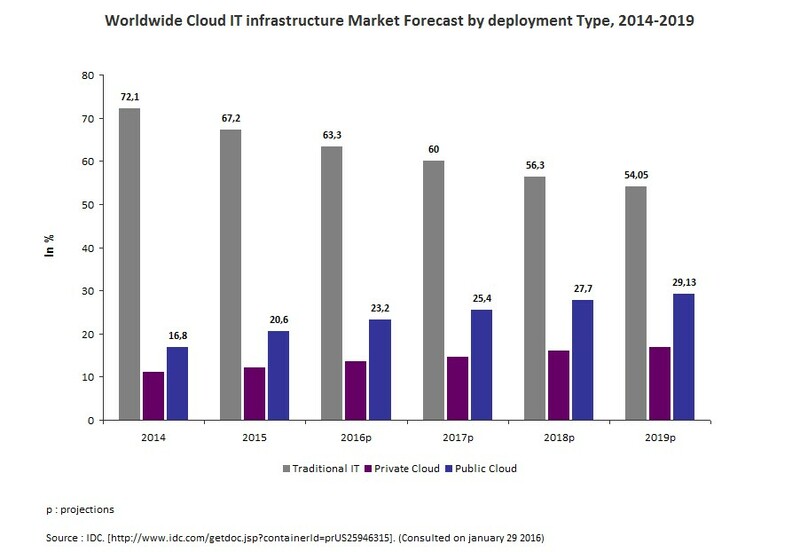 The public cloud infrastructure, for its part, is geared to the broader public and managed by service providers. Cloud computing represents an enormous worldwide market already pegged at $175 billion (data for 2015). In 2016, this market is expected to reach the $204 billion mark worldwide. What’s more, the growing demand for this technology in business practices has added 14 million jobs to the world economy, according to estimates put forward by the International Data Corporation (IDC) for the end of 2015. 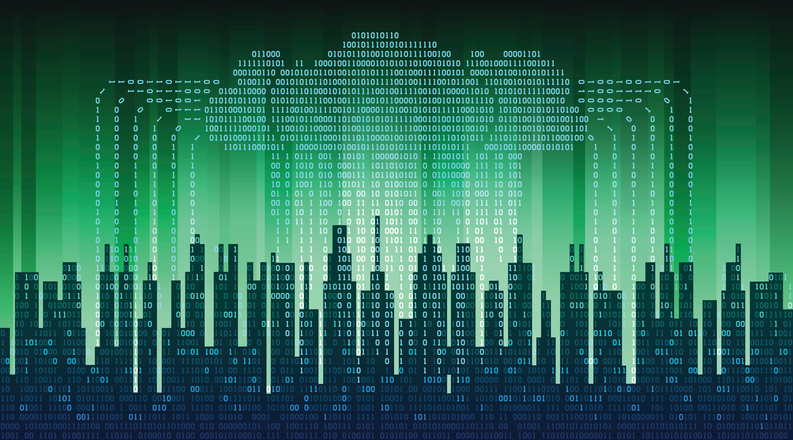 The IDC also reports that Montréal should benefit from 7,800 cloud computing jobs in 2015, with the expectation that about 50% of these jobs will be created by small- to medium-sized enterprises. In addition, the rapid growth of the cloud computing market has fuelled a spike in the use of data centres, which are often cited for their ecological impact. 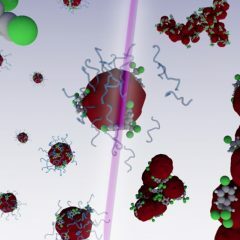 This problem has sparked considerable interest among Montréal-based researchers intent on coming up with green cloud computing solutions. 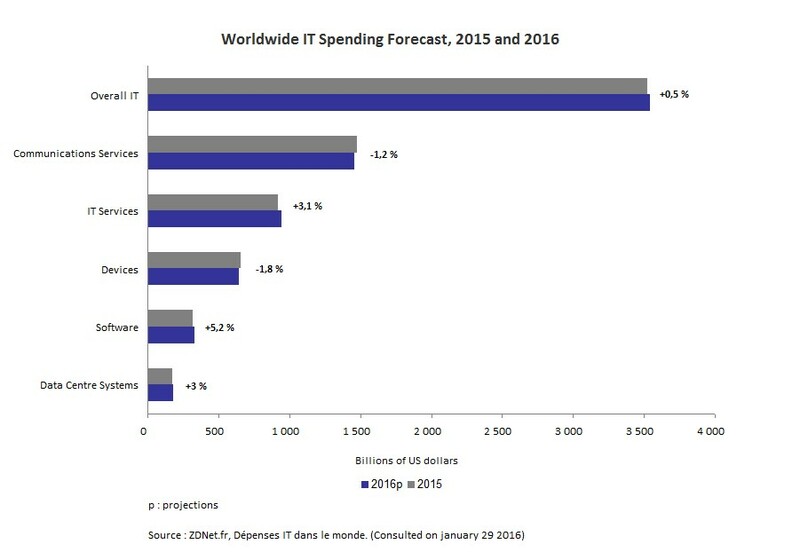 Worldwide computer-related expenses reached the staggering sum of $3,517 billion in 2015. In 2016, that figure is expected to rise to $3,536 billion, a growth of about 0.5% over one year. This growth can be attributed mainly to software investments (+ 5.3%), IT services (+3.1%) and data centres (+3%). These three segments are largely favoured by the increased demand for cloud computing. 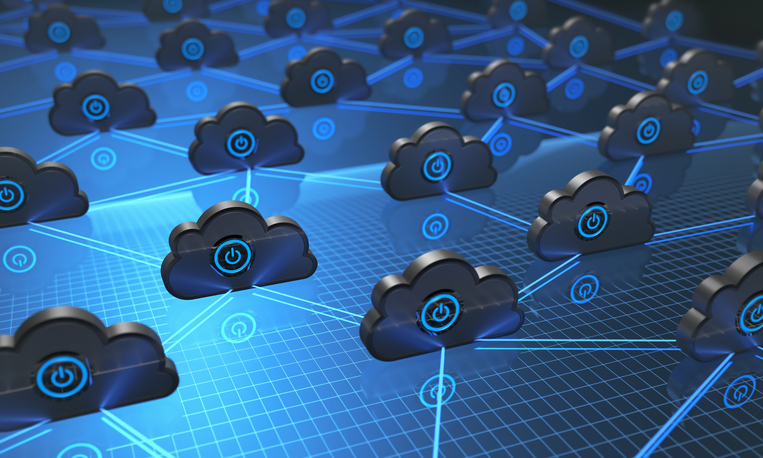 According to IDC, investments in cloud computing infrastructures rose to $32.8 billion in 2015, thus accounting for a third of expenses earmarked for IT infrastructures. This trend has shown no signs of slowing, since these expenses are expected to reach the sum of $54.3 billion in 2019, thus accounting for about 46% of all anticipated IT expenses. What’s more, cloud computing expenses are incurred mainly by public infrastructures, which account for a share of more 60%. 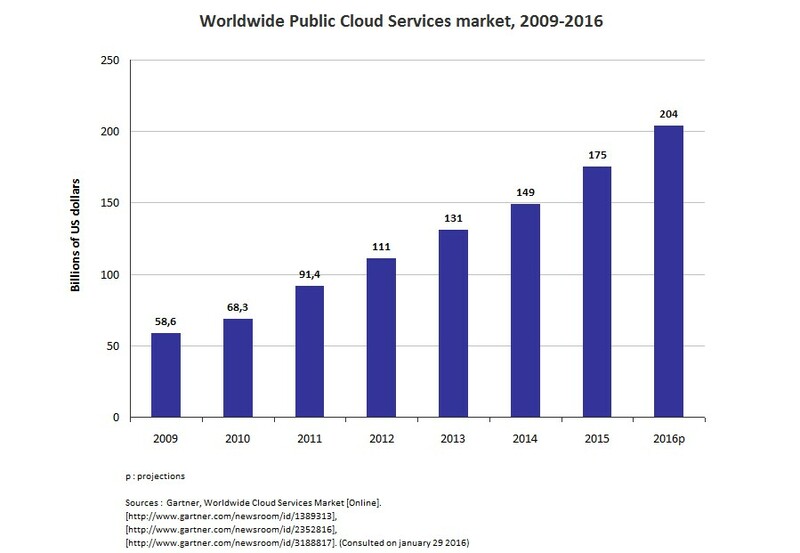 Worldwide revenues from public cloud computing services are expected to increase by an average of 19.5% during the period from 2009 to 2016, to reach the sum of $204 billion by 2016. This represents an increase of 16.5% in 2016 compared to the revenue generated in 2015, according to forecasts put out by the American firm Gartner. For the same period, the highest growth – about 34% ­– was recorded between 2010 and 2011. According to several IT analysis firms, the dynamic fostered by cloud computing investments is creating opportunities that benefit the economy as a whole, and particularly the job market. That’s exactly what was revealed by an IDC study on worldwide forecasts for employment created by cloud computing. According to the study, cloud computing generated 13.8 million new jobs across the world by the end of 2015, good for an average annual growth of 27% between 2012 and 2015. The main job creation sectors are comprised of media and communications, financial services, and manufacturing. In 2015, these sectors accounted for more than 35% of the jobs created in cloud computing. Across the world, it’s important to specify, small- and medium-sized enterprises account for a larger proportion of the jobs created in cloud computing than corporations. In 2015, small-to medium-sized enterprises created some 7.5 million new jobs (54.3%) in cloud computing, compared to 6.3 million such jobs created by large corporations. On average, during the period from 2012 to 2015, the growth in cloud computing jobs was slightly higher among SMEs (28%) than it was for large corporations (27%). On a Canada-wide scale, some 70,000 new cloud computing jobs were created in 2015, including close to 7,800 jobs in Montréal. Furthermore, Montréal-based SMEs used this technology to generate close to half of the jobs (49%) created. The explosion of cloud computing generates significant traffic in data centres. According to the firm Cisco, in 2017 data stored in virtual environments will account for some 76% of traffic in these centres. As well, data centres are known to exert a non-negligible ecological impact. On a worldwide scale, data centres account for 1.5% of electrical power consumption and 2% of CO2 emissions. In light of these environmental issues, innovation is a necessary imperative. In Montréal, several researchers have understood this and are developing solutions meant to promote green cloud computing. 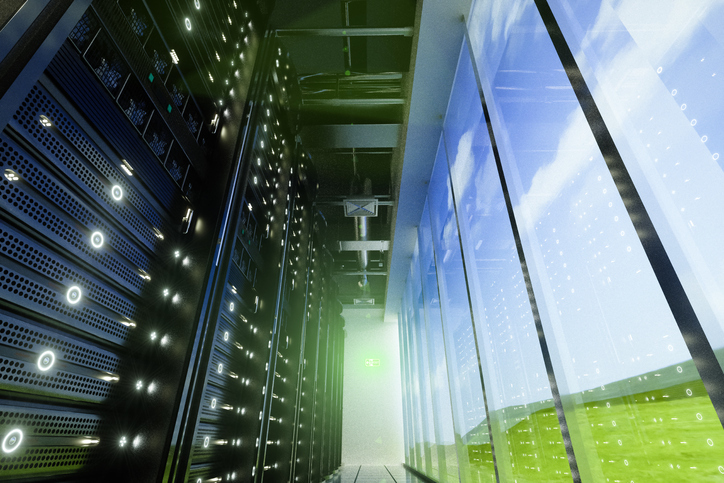 Green cloud computing will help to optimize energy consumption in data centres and in the use of software applications. The Eco-Cloud Research Chair affiliated with the École de technologie supérieure de Montréal (ÉTS) is working to promote the use of renewable energy in information technology. More specifically, it has developed smart and green cloud computing applications that promote the implementation of eco-efficient data centres. The work of the Chair, which has five related patents, has given rise to numerous partnerships with industry. 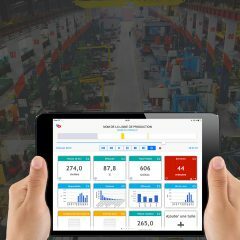 For example, in collaboration with CRSNG and Ericsson Canada, the Chair has developed the Telco Cloud platform, which allows the multinational to optimize its data traffic while reducing energy consumption. Other Montréal innovations include the software applications Cloptimus and TailorVM, both developed by LORLAB at the École Polytechnique de Montréal. Cloptimus lets users achieve more effective planning of cloud computing networks by taking into account performance, costs, greenhouse gas emissions (GGE) as well as certain administrative constraints. This solution may be used for the optimal deployment of data centres, notably as it pertains to the number of servers housed and their geographical location. TailorVM, for its part, contributes to the management of data centres, optimizing energy consumption as well as application and network performance. The SWAT research lab affiliated with the École Polytechnique de Montréal offers sound software design and development practices that minimize the environmental footprint exerted by cloud computing applications in data centres and by mobile applications. 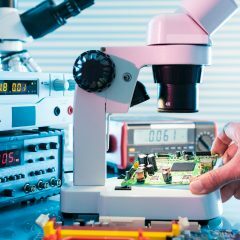 The continued development of these innovations makes it possible to achieve energy improvements without sacrificing the quality of service (QoS) for the end user. To sum up, information technologies have the potential to reduce GHG emissions, thanks in particular to the development of computer applications that respect the environment. Green cloud computing is one such example. The innovations presented here are a good illustration of Montréal’s know-how when it comes to the deployment of less energy-intensive cloud computing practices, and they may provide economic benefits as well. Indeed, these innovations hold considerable promise for companies of all sizes providing services or developing cloud-based solutions.